Here is our latest and last update of the team for the supercross. The pack includes all the gear, bikes, helmets and wheels. Click on the render to download our complete pack. I know it's huge, so I've split it up into several smaller packs if you would rather download them like that. The pack includes each colorway of Alias A1 gear for each team member, and also a set of One Defcon gear for each team member. 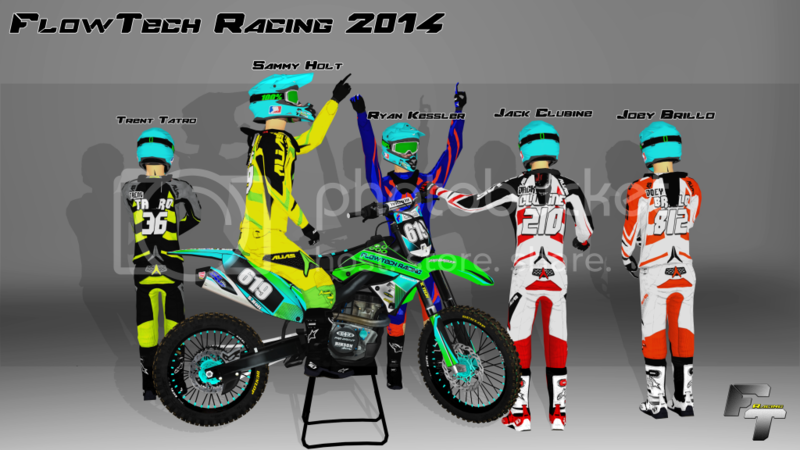 There is a kx250f and a kx450f for each team member and also a kx125 and a kx250. There is a numberless version of the bike in the pack in case anybody feels like using it. As many of you know, we have been hosting an Arenacross series based on the real Amsoil Arenacross series. It's been a lot of fun and I just want to say that we will definitely continue to host more events after Arenacross is over. For those of you who don't know, make sure to check out our website here for up to date info on upcoming races. JLV - For his amazing game. Jack Clubine - For all his hard work on graphics and for being such a helpful person. P2sta - For his render background object, stand, rider model, and wheels. Stevoktm - For his Kawasaki model and template. TH_722 - For his Alias A1 gear and template. NAUpoiss75 & P2sta - For their Shoei model and template. NAUpoiss75 - For his One Defcon gear and template. cross17 - For his 100% goggle resource. T-rider - For his kx two stroke. Greg Dearman - For exporting the two stroke jms. Joey Brillo - For starting the team. Jeremy's 250 East Red Plate. It's a 5mb download so just do it. Updated bikes we will be using for the remainder of SX and Nationals this yer. Huge thanks to Andy for the KX. I'm racing 450's this week and i hate them, so download my 350! Switched teams, so make sure you can see me for the remainder of SX! do you guys want another rider? Thanks August for the gear template, I used that.